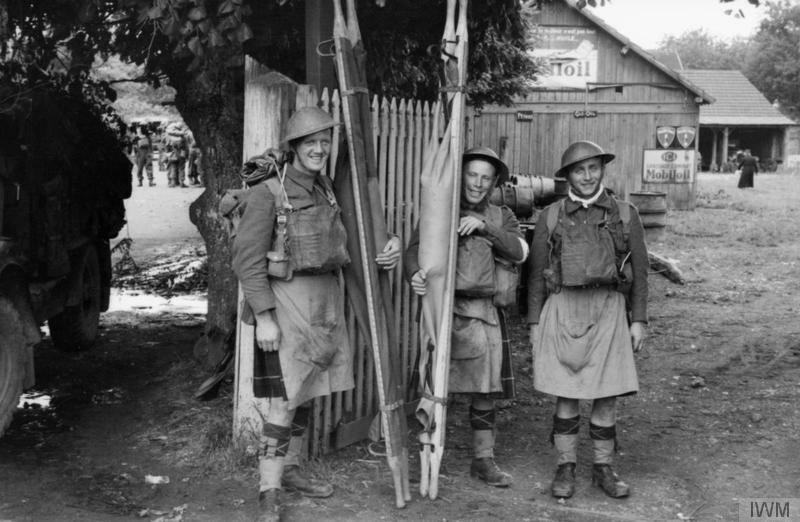 The use of Kilt Aprons and Kilt Covers really went into full swing during WW1. 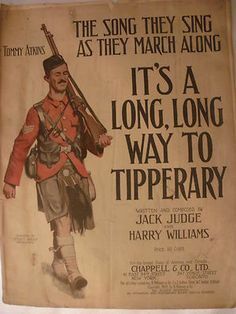 There certainly were previous times soldiers covered their kilts, examples include things like drummer aprons, but the need for a good quality cover didn’t really exist. 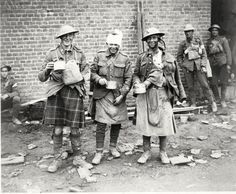 World War 1 was largely fought in the nasty dirty environment of trenches throughout Europe and soldiers and command were looking for a way to protect their kilts from getting all grimy and wet. As you can imagine mud and rain and being outdoors for an extended period of time can make for a worst looking uniforms. Anything to help a soldiers outfit survive the elements was always welcome. Someone in the upper chain of command created an order to have Kilt covers made and the rest is history. How this came to be is a little fuzzy. One possibility is that a soldier or officer came up with the idea and the Army adopted it. It could have been idea from a soldier who was in a previous war or a food handler, cook, server, bartender or butcher. 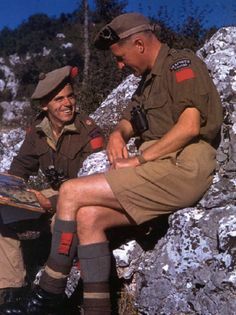 Both the Canadian and South Africa kilted regiments had to purchased their uniforms, so someone within their ranks might have paid a company to produce one. After seen one, other soldiers might have also started creating their own and it sort of snowballed. However the kilt apron or cover came about, it became a staple for kilted troops. From my research, there appears to be two distinct types of kilt coverings. A full wrap around design kilt cover and a simple kilt apron. Both designs used a common cotton waist drawstring to tie the apron or cover around the kilt. Some covers and aprons also have holes in the front to attach to kilt buttons. The material was usually a light brown or khaki cotton drill and had a front center pocket to hold various items. The front pocket substituted as a sporran, allowing soldiers to keep their valuables up front. The phrase “family jewels” has been associated with Sporrans as a place to keep valuable items as well as protecting a man’s valuable parts from the front. Of course, kilt aprons don’t have the protection of a sporran, but they did serve a purpose of storing small items. As with most wars, when resources start becoming scarce, the military looks for ways to cut corners and save. I am not sure if this was the case for the kilt cover, but since the full cover required more material and more labor, they might have decided to save money by producing a half cover or apron. This of course is only speculation, but base on the reasons why the kilt was phased out during WW2, it makes sense. In the pacific during WW2, the Japanese initially produced high quality bayonets, both in material and craftsmanship, but by the end, obvious shortcuts were made in the production including cheaper metals, less material and shorter production time. The full kilt covers consist of a fully wrap around design, including a front pocket, pleated rear, a cotton drawstring and 2 other cotton ties. The half kilt aprons only protected the front of the kilt, but still had the front pocket and cotton drawstrings. Both covers and aprons appear to have been produced throughout WW1 and were eventually phased out near the beginning of WW2. After WW1 the kilt aprons and covers were stored with other military items waiting for the next war. 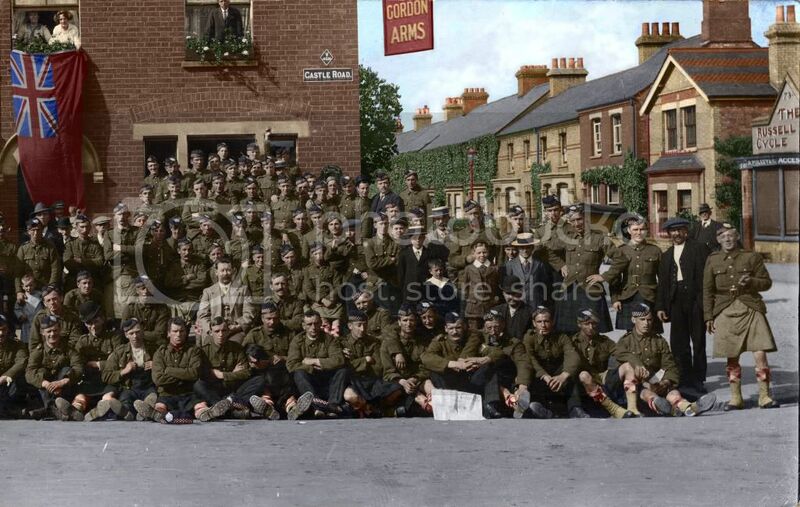 Unfortunately the wait wasn’t very long for they were re-issued in 1939 to the British Expeditionary Force (BEF). 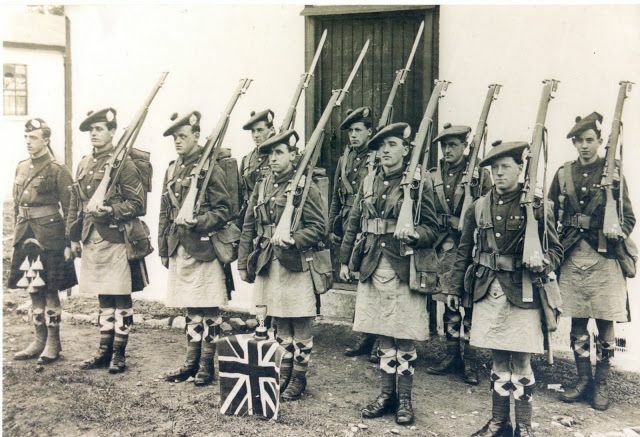 After the Dunkirk retreat, many units phased out the kilt and replaced them with standard issue battle dress. This for the most part ended any need for a kilt cover. The War Office issued a decree that kilted regiments would no longer be kilted. The basis for the decision was the fact that battle dress trousers used less fabric, were easier to maintain and much cheaper to produce. 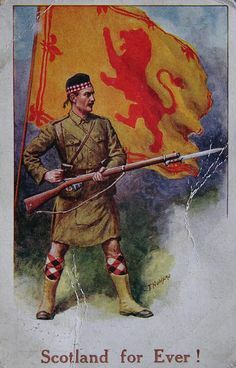 While in battle dress, many of the formally kilted troops would wear swatches of tartan worn behind their bonnet’s cap badges or as a shoulder insignia, thus insuring a little bit of the kilt remained with them. Here are some WW2 medics keeping the kilt tradition alive. One thing that makes this particular image interesting is the fact that the front pockets of the kilt aprons look like they actually have things in them. Jolly good. I have read accounts where soldiers during the warmer months would strip off their heavy kilts and just wear the kilt covers. From a comfort standpoint it makes absolute since. Who would want to have to wear a hot and sometimes wet and heavy kilt when they could wear something much lighter and cooler. Another interesting point about the full kilt cover is it came with pleats, just like the kilt it would cover. The reason for this is quite simple, if it were a pleat-less cover, it probably wouldn’t allow additional movement that a pleated kilt does. While some kilts weren’t that flashy, some were rather bright, so the covers helped make them less conspicuous from a distance.